The unique AiroBrush provides a superb level of carpet care. While it comes as standard with the Henry Xtra model it is also available as a useful upgrade to any Henry/Hetty model in carpet owning households. 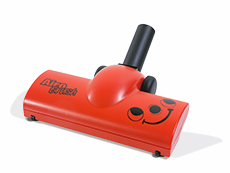 Underneath the Airo Brush has a rotating brush which provides a beating action as you clean your carpets. The brush is powered by the superb air flow from your Henry Vacuum, so no additional cables or other power source is required. When buying a Henry you want to make sure you find a good supplier and you want to get the best price on your vacuum cleaner. Online it can be difficult to know which suppliers you can trust but I have found, to my surprise, that Amazon sell other things beside as books. What's more they have some of the best prices and provide the security of buying from a well known and trusted brand. So I have included a Henry product link to Amazon on this site which displays their current price, typically the best price on the web.